WHY SELL A GREAT BOOK FOR JUST $0.99? To ensure a strong launch of the book on Amazon there is a window in the first week when we spike downloads by offering the book for only $0.99. Get it right away on Amazon! In How to End the Stories that Screw Up Your Life, you learn how to use Self-Inquiry to transform your thinking and return to the effortless joy of simply being yourself. Through easy-to-follow explanations and step-by-step instructions, Ernest Holm Svendsen reveals his vast experience as a trainer and facilitator as he guides you to your own in-depth understanding of one of the most effective ways of working with your mind. Acquire a powerful set of tools to tap into the age-old process of self-examination that has been at the core of every major school of human development in history, and learn how to use a unique form of Self-Inquiry known as The Work of Byron Katie to undo your painful and limiting stories about your past and future, about yourself and others and about what you can and cannot do. GET THIS AMAZING NEW BOOK FOR JUST $0.99 RIGHT NOW! "I loved everything about this book, from start to finish: The theory and teaching described in Part 1 are helpful to follow and understand, the map of reality described in Part 2 is brilliant, and the beautiful simplicity of the practice described in Part 3 makes taking each step clear." "Ernest Holm Svendsen does a brilliant job of making this process accessible to anyone. In this book, he explains what inquiry is with simple, clear analogies. He demonstrates how to do The Work of Byron Katie with step-by-step instructions. He points out the common pitfalls, and how to sidestep them. He shares his personal experience with many examples from his own life. And he inspired me to keep going deeper with this practice that I've been enjoying for over 11 years. This is a great resource book on The Work of Byron Katie, worth reading again and again." "I have been practicing and teaching The Work of Byron Katie for about 10 years now. This the first guidebook I read that covers all the question that arises when you are new to The Work and want to find your way with it on your own." 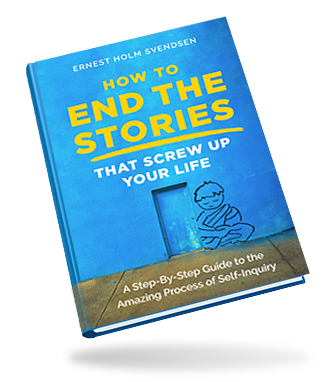 "Ernest Holm Svendsen has given us one of the best books I’ve read on overcoming the needless limitations on how we live our lives."